I am in love with using Henna. I get it from my favorite one-stop-shop, Sugar Magnolia. They have tubes of the pre-mixed Henna for $4.50. I have seen it for $15 at big craft stores, of course those are crazy colors that don't last as long. I love the traditional rust red color that it turns into anyway. I have seen many customers using it, they have amazing detailed patterns. I started off looking a few design books that Sugar has. The patterns and images on flickr were inspirational as well. I noticed that no two were remotely the same. Then it makes it so much more personal if the designer creates their own patterns. I love flowers and mandala circles. I did use a few key design elements from the images I saw on flicker, the dark three leaves and lotus pattern can be seen. The rest I came up with as I went along. It took me about 40 minutes to complete the mini sleeve. The tube squeezes out a very consistent thin line. Much like a pastry bag to put on icing. Start big... the smaller your pattern the harder it is. It can be wiped off with minimal stain with in 1-3 minutes of application. Keep paper towel near by to dab the tip on or wipe away crazy lines. Now, sit still. I find it is a very calming meditative task. I don't find it hard to sit for a while holding my arm up awkwardly, my hubby thinks I am nuts for taking the time to do something that takes forever to dry and only lasts 4-5 days if you don't scrub it. Mind you that is coming from a guy that has a few large tattoos. I am sorry I am just not into pain. This just tickles and you have to sit still for awhile. Its a cheap summer creative fun. I used about 2/3 of the tube. I just put the yellow pin back in and put in a baggie to use later. I keeps for awhile in a normal temp. environment. These images are of after it sat on my skin for about 20 minutes. It is dry to the touch but has a nice crust formed. After this happens you can move a bit more freely. Try not to peel it off at this point. The longer that you and leave it on at this point the darker that it is when you peel it off. You can tell when it is done because the lines crack and little pieces flake off. Patience and sitting still is key to having clean dark lines. This is the next day. I actually leave it on all night. I would not recommend doing this, you will wake up with little black pieces in the sheets. As Leah puts it, little ants. I love it on my finger tips. I thought it was really interesting that they black out their fingerprints in some of the traditional patterns. I need to find out why...Do you know? I had to throw in a precious furry face that sat next to me the whole time to feed her. She has patience for days! This building was not in great shape to begin with but its one of the first mill homes in Caraleigh. There were a few huge poplars in this yard that they cleared out one already but you can still see the other one in the back. This was a beautiful yard! Now it is just piles of tree limbs. Look at the size of that trunk that fell on top of this house. It has no glass in any windows. Fence is gone, Cedar is from a block away that ended up in the street. This was a auto body shop across the Expressway from my neighborhood. It is less than four blocks from my home. Roof gone while the owner was untouched inside. This is what it looked like in my neighborhood right after the storm hit. This used to be our fence line. There were large trees through it. The house below is about the only two story house in the neighborhood. It had lot of damage. The tree that fell on it was cleared quickly. The chimney fell into the roof as well. There were three very large Oak trees in their yard that are now in their neighbors yard. It is crazy! Today, I thought about rebirth on many levels. The most major rebirth on my mind is my neighborhood. I cry everyday when I drive to and from the house. It is heartbreaking the effect that a 2 minute long tornado had. It is a slow process and I know it will never be the same. It has been hard on all of us and my neighbors since it came and destroyed so many lives, houses, business and trees. These are a few shots from my neighborhood I took today. mind you this is almost 10 days after the tornadoes came. There used to be 4 more huge oak trees here. The church is to the right with lots of broken windows. These are what is left of the business that are three blocks from my house. These buildings no longer have roofs. So, on Saturday I worked an outdoor festival in our city downtown square, at 2 we were told to pack up and leave due to a strong storm system heading our way. We packed up our tent and got back to the store about that time sirens at the campus across the street went off and we were informed to seek shelter due to a tornado. It passed very quickly and with lots of force. We were fine in the store and then quickly realized that others were not so fortunate. My neighborhood was leveled, thankfully our home is fine except for limbs on the house, missing shingles and demolished fence and yard. I live in a beautiful historic mill community with amazing small 100 year old homes. My hubby and dog were at home and were told to evacuate due to a gas main break and down transformers and power lines. I left work and got on I-40, because many lights were out. I got off I-40 a mile from my home and was told that I could not drive further. I walked up the deserted 8 lane highway to get to hubby and Kuma. It was a war zone and smelled of gas in the air. Large warehouses are gone, 70 year old businesses are missing roofs and flattened, 200 year old oak trees are shredded. Many houses are missing roofs just not there or have trees through them. I also know that some of our neighbors lost their lives. I was stopped by many neighbors to see if I was OK and asked if we needed help. I am so humbled by the experience and thank god that we are all safe and together and that so many were concerned with our safety. This storm system created 65 tornadoes across N. Carolina. It is terrible. My thoughts are with all those that are less fortunate than us. We are in a hotel thanks to our parents and will continue to be here until the neighborhood is no longer declared a disaster zone. I am hoping that comes much sooner than later. 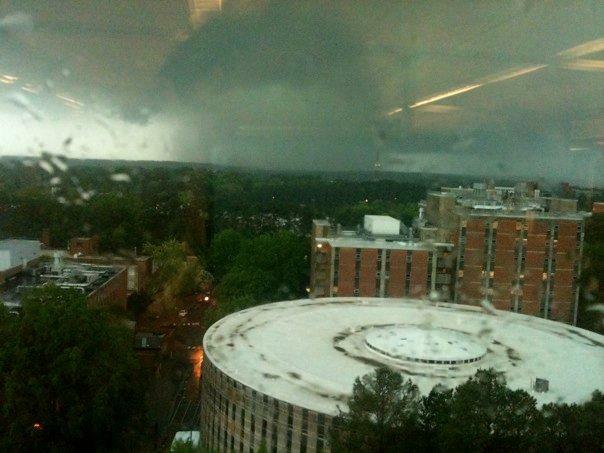 This image was taken by a student on the 15th floor of the Campus Library looking in the direction of my neighborhood. You can see the dark center tornado. I have been on a hunt for chairs. We are having a party and we have no chairs. I am trying to keep it cheap and non-plastic, I have been to four consignment shops, and scooped out a few yards sales. I also went to Shelton's in downtown Raleigh on W. Morgan. I loved that spot. The older man that works there is not the nicest of man, but they do have a heck of a lot of awesome finds. I bought a sweet mid- century side table. Still is not a chair but, I love it and had to have it! Ill show you later. I also went to the Flea Market as it was closing up. I have mentioned this before, but I would like to reiterate how much I personally enjoy the NC State Fair Grounds. I live 10 mins. from this awesomeness! I took my sister on the way back from Chapel Hill. My sister actually took these shots with my camera, Thanks Lil! The top shot is looking into this giant cart that is filled with small cast iron figures, hooks, and plaques. This cart is always there. I look in it every time I go, one day I will buy something from the menagerie. Lil and I love these crystal door knobs. Our great aunt had amazing cut glass/ crystal door knobs in her home that our family built in the 1910's. It was an amazing place to grow up visiting, these reminded us both of that house. Someday, I will own a dress form, this one was old and difficult to size. Also, Uncle Sam didn't give me that much tax money back. I finally found a cheap chair that I bought from this dude who wears a black velvet top hat. He is very animated and conversational. Always makes me smile. I have learned to look for certain faces. Some booths are filled with junk, but most are awesome. Here is the journal cover I made for my self recently. I am a list maker, doodler and all around space cadet. This requires me to always need paper and pen. I make many lists through out the day, most are work and shopping related. My favorite list are pros/ cons and bucket style lists. I have gotten to many goals in life from a silly list. Silly as it may sound this is a huge tool that has gotten me here today. I needed something pretty to mask how busy those lists make my life. I love the mix of these fabric scraps. The teal to the right gets folded over to make the lining, don't forget a ribbon and a pocket. Here it is with the teal lining folded and pressed under. Yellow quilting really made this item more modern. I found a perfect purple velvet button for the ribbon to wrap around the back. Next time I'll make it a tad roomier and pocket much longer. I still love it and did you catch that it matches my sun glass case? Wow, March disappeared. I have had grand intentions of trying to be better about blogging at least once a week, Ooops! Well, I am here now and that is what counts right? April started off cold, I was very concerned about the tulips that my hubby planted would not make it! Not all, but a lot did. I had yellow, dark pink and these orange tulips everywhere. It was super nice because they came in right after the daffodils finished up. I adore this shot of the tulips tucked in between the trunks of pecan trees. My hubby gets rather whimsical in his seed/ bulb placement. He was sooo excited about these coming up between the trees. I was a tad late in taking the shots. Most of the tulips have fallen open. However, it makes for an awesome display of colors. I hope to use the shot above in some artwork or masthead. I promise that I will try not to have just trees and flowers to show you. To be honest though, flowers, nature, and trees are a huge part of my life. I incredibly fortunate to live in N. Carolina surrounded by green and flowers. They are inspiring in many ways!